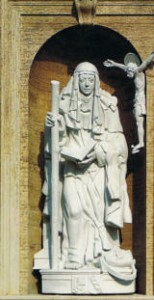 St. Bridget of Sweden was born in 1303 near Stockholm. She came from a well-to-do and politically influential family. Since early childhood she felt a great love for the Suffering Christ on the Cross who had spoken to her in a vision. The motto of the Bridgettine Order is based on that vision: Amor meus crucifixus est. She married young, the wealthy Ulf Gudmarson, with whom she had a happy marriage. The couple had eight children. St. Bridget influenced the politics of her country at that time by her critical and prophetic statements based on a vision she had had. To be “God’s mouthpiece” was the mission given to her by God. In 1344 St. Bridget’s husband died. She then embarked on what was going to be her live’s work, the founding of the order “Ordo Sanctissimi Salvatoris” (The Order of The Most Holy Saviour). She made a pilgrimage to Rome in 1349 to seek papal permission for her new order. But she remained without success for a number of years. St. Bridget spent more than 20 years in Rome where she died in 1373. During this whole period she tirelessly opposed the moral corruption and religious decadence of her time by her prophetic messages. In 1370 the Pope finally gave his permission to this prophetic and visionary woman to found a monastery of her new order. This happened in Vadstena, her Swedish home. About 70 monasteries were eventually founded all over Europe. The order was almost destroyed by the Reformation in the 16th century. 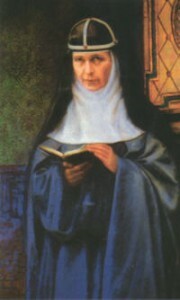 Like St. Bridget, Maria Elizabeth Hesselblad was also from Sweden. She was born there in 1870. At the age of 18, she emigrated to the United States in order to support her family. She initially worked as a nurse and then started studying medicine. But a serious illness destroyed her plans. She decided to spend the short remainder of her life in the house of St. Bridget in Rome and wait there for death. She felt very close to this great saint and her order. But contrary to all medical prognoses Maria Hesselblad recovered unexpectedly. She now wanted to do what she had discovered as her mission: a revival of the old Bridgettine order through internal reform. In 1920 her newly founded order received the Church’s authorization, and additionally in 1942 the permission to keep the name of the old Bridgettine order: Ordo Sanctissimi Salvatoris. Mother Elizabeth died in 1957, in Rome, in the house of her great predecessor, St. Bridget of Sweden.